I wonder if Bob Shennan had to complete extra compliance paperwork to get him back on-air? 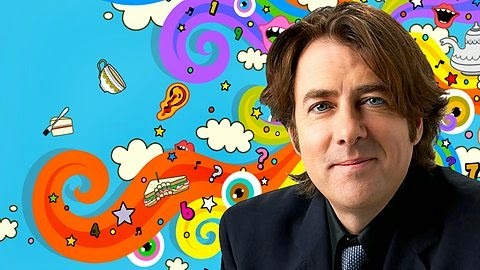 Yes, it won’t have escaped your notice that Jonathan Ross is making a (brief) return to Radio 2 this week, sitting in for Wrighty. Looking back I’d forgotten that Ross did his Saturday morning show for about 11 years – not a bad run. In fact his radio pedigree goes back even further, to the summer of 1987, when he stood in for a holidaying Janice Long on Radio 1. This clip comes from 22 June 1987, where Jonathan seems unduly concerned about his thumb. There were other Radio 1 appearances on Singled Out and My Top Ten and contributions to Radio 4’s Loose Ends. Then in 1988 Jonathan was part of the launch team for the overnight Super Station. This clip comes from 23 October 1988. Wanting to re-create The Last Resort for the radio he was asked to bring a chat show to Radio 1. The Jonathan Ross Radio Show ran for 13 weeks in the spring of 1990 with a script co-written by Danny Baker, music from Victor Lewis-Smith and guests such as Hugh Laurie, Jools Holland, Punt and Dennis, Reeves and Mortimer and Jo Brand. Ross didn’t return to the radio until 1998, this time on Virgin 1215 and then the following year there was the start of the Radio 2 Saturday morning shows. From about half-way through the run comes this programme from 23 October 2004. I’ve edited out the music from this 3-hour show, aside from a live acoustic performance by Graham Coxon, and it still runs at one hour and 20 minutes: he really did like the sound of his own voice! It’s the usual mix of stream of consciousness, banter with producer Andy Davies and a quiz that sounds like it was made up during the show, and possibly was. Alongside Graham Coxon, the guests are Julian Clary and Russell Watson.